ASHEVILLE — Another Asheville apartment complex is under new ownership. The 168-unit Woodberry Apartment complex at 10 Alexander Drive was sold Friday to Tampa, Florida-based Southport Financial Services. The company’s website shows it owns or has a financial stake in 167 properties in 19 states, including two others in North Carolina. It was purchased through the recently established DP Woodberry Apartments LLC. Woodberry was built in 1987 outside of downtown Asheville. Its archived website shows one- two- and three-bedroom apartment layouts ranging from $875 to $1,360 a month. Property sales of this nature have become increasingly common in Buncombe County. 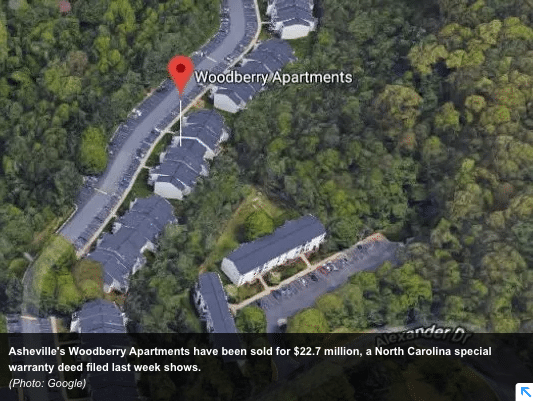 East Asheville’s Parkway Crossing Apartments near Tunnel Road sold to a California-based company earlier this month for $27.3 million, the third time the property has changed hands since 2000. Asheville’s commercial properties also have been a popular target. The city’s historic Grove House, which houses Scandals Nightclub, Club Eleven on Grove and The Boiler Room, sold in December for $2.9 million.